This week we are most pleased to bring you a gorgeous and melancholy tale from Celeste Ng. Mining the platinum veins of the unspoken and unspeakable in family affairs, Ng gives us both the richness of childhood imagination, and the frigid non-negotiable truths of adulthood. Please enjoy this short story, "We Are Not Strangers" by Celeste Ng. 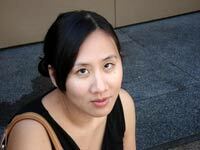 Click here for an interview with Celeste Ng.